Just two days ago, I graduated high school. My classmates and I wore white dresses and held bouquets, walked down an aisle to an outdoor stage (sounds like a wedding, doesn’t it? ), and waited anxiously to receive our diplomas. During stressful moments and late-night study sessions, I vividly imagined this day in my mind, maybe even counted down to it. Now that toasts have been made and achievements celebrated, it hasn’t sunk in yet that I will not return as a student to the place where I spent the past six years of my life. 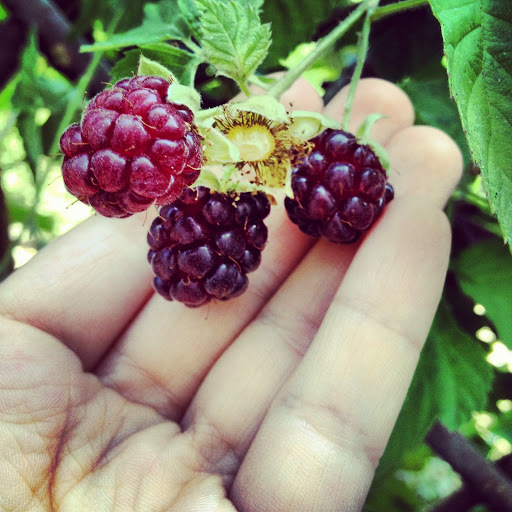 Picking blackberries from my backyard garden. Change is a funny sensation, because transitioning from one chapter of your life to the next never feels the way you imagined it would. I thought it would be easy to say goodbye and look forward to entering college, but this past month has been incredibly bittersweet. How do I thank my amazing teachers and advisors, my peers, and my family members for all they’ve done to help me grow? How do I prepare for a completely new environment filled with thousands of unfamiliar faces, historic buildings, and dorm life? Well, for right now, I’m focused on savoring the moment. I want to let my experiences come naturally rather than always look ahead or to the past. I plan to spend this summer doing what I am passionate about; no strings attached. Obviously baking ranks high on my list of passions. Which leads me to this cake. 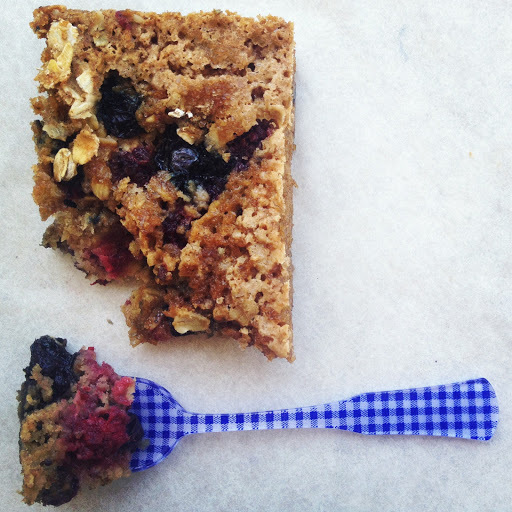 A cinnamon-scented oat cake filled with ripe, seasonal berries. 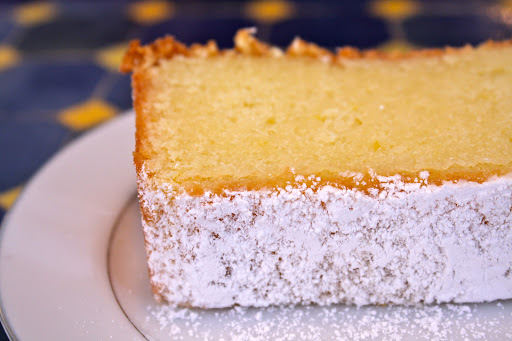 The top is crunchy from a sprinkling of turbinado sugar, but has a soft, tender crumb on the inside. 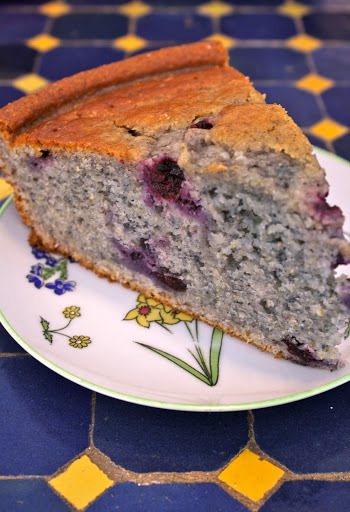 I love the cake’s rustic simplicity, because during this time of year it’s all about allowing the produce to shine. 1. Preheat oven to 350 degrees F. Position a rack in the center of the oven. Butter and flour an 8-inch square metal baking pan, tapping out excess flour. Combine 1 cup oats and water and let stand until oats have softened, about 5 minutes. Meanwhile, whisk together flour, baking soda, baking powder, salt, and cinnamon in a medium bowl. 2. In the bowl of a stand mixer fitted with a paddle attachment, beat together butter, granulated sugar, and brown sugar on medium-high speed until light and fluffy, about 3-5 minutes. Reduce speed to medium and beat in egg and vanilla until just combined, scraping down sides of bowl if necessary. Add flour and oat mixtures and beat on low speed until just incorporated. Do not overmix. Gently fold in about half of the berries. 3. Spread batter in pan and sprinkle with remaining 3 tablespoons oats and sanding sugar. Scatter remaining berries evenly over top. Bake until a toothpick inserted in center comes out with moist crumbs attached, 40 to 45 minutes. Let cool on a wire rack at least 30 minutes before serving. It’s best served on the day of.